Neko Atsume has an absolute wealth of cats at this point, most of which are your standard kitties with normal food requirements and a sizable list of items they enjoy. You've probably gotten your fair share of standard cats during your time with the game, but what about rare cats? Rare cats come in all shapes, sizes, and adorable levels! We've gotten a few updates since Neko Atsume finally released in English in 2015, bringing such little joys as Frosty, Sapphire and Jeeves, and Bengal Jack. It would be nice to get more updates with even more rare cats, but we'll take what we can get. I'd previously written a rare cats guide here on GameSkinny that is now slightly outdated, but if you're interested in the old format feel free to take a look. I've been at this Neko Atsume thing for a bit, having played the Japanese version months before we got it in English. This time around we're having a bit more fun, with each cat given a short bio describing it along with its personality, power level, eventual memento gift, and what you can set out to get these little bundles of cute to stop by your home. 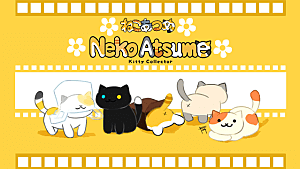 The most important thing to take away from this and Neko Atsume as a whole is to just have fun! It's a slow, relaxing game. Don't stress if you can't get the cat you want to visit, just keep setting out the things it likes and in time it will stop by for you to take a picture. 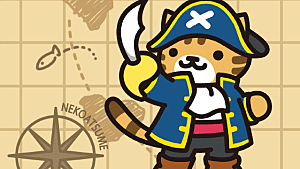 Bengal Jack is the most recent addition to the Neko Atsume kitty cast and he is just cute as a pirate cat can be. 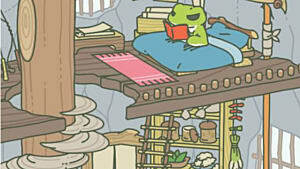 This little guy only has two things on his mind: luxurious food and treasure! A cat with a reckless personality and a meager power level of 66, he has keen nose for the Luxury Treasure-box item and he isn't scared to share it with other cats. He'll eat a few different types of food, but his absolute favorite is the purple-canned Deluxe Tuna Bitz. Once this swashbuckling kitty trusts you enough he'll give you his trusty Old Map as a memento. An orange tabby with a distinct Wild West style, Billy the Kitten is as cute as he is stylish. He may not be as well-dressed as some of the other rare cats that pay you a visit, but his little bandana and hat are just perfect. Billy is probably one of the least picky rare cats, as he will eat just about anything.. except sashimi. Because cowboys don't eat sashimi. No other cat can even get close to the Cowboy Hat once this nihilistic, 250 power level bundle of fuzz sets his sights on it. Once he has gotten himself acquainted enough with your Cowboy Hat, he'll give you a Lucky Coin as a memento. No other cat in the game has the passion for the great outdoors as Bob the Cat, even if every other cat sitting around in and around your house seems to have a penchant for wandering around outside. An outdoorsy cat with a power level of 40, Bob will come to your house no matter the food you lay out. His one want from you is the Cat Metropolis item, which he proudly stands atop like it's his most recent mountain conquest. Once Bob the Cat has enjoyed the view on top of the Cat Metropolis enough he will give you the Antique Compass memento item. Chairmain Meow is a lot more pleasant than the real world dictator that his name is similar to. Or at least, he's a lot less harmless and a million leagues more adorable. A boorish and militaristic kitty, Chairman Meow's reasonable 111 power level doesn't do him much good nor harm when he's taking his place at the Sunken Fireplace -- he can sit atop it even if it's already swarmed with three cats. Once the Chairman is sure you and your house are safe, he'll give you his prized Dog Tag as a memento. A train-loving Calico, Conductor Whiskers will only stop by your home if you have some train-like or related items set out. She seems to take after Tama, the station master cat from Wakayama, Japan who greeted station visitors and passengers for eight years until 2015. Conductor Whiskers herself is a very vigilant kitty but only has a power level of 50 and two items she likes, so be wary of other cats coming and making use of the Twisty Rail and Cardboard Choo-Choo. After Conductor Whiskers has been sure you're house is a safe place to play train, she'll bestow unto you a Hand-written Ticket memento. An icy-cold cat with piercing red eyes, Frosty's all about his comfort -- as you can see in his favorite items below. While you may see this kitty on any number of items, his absolute favorite is the Snowy Pillow. Frosty may appear either with or without his straw coat, but getting to see him may be hard. He's a sensitive cat and only has a power level of 5. You can use the Snowy Pillow to have a higher chance of him visiting, but it still might be hard to actually catch him in action. Once Frosty has made himself at home in or around your home enough he'll leave you his trusty Thaw-Proof Snowman memento. Note: It's easiest to get Frosty to visit using the Snowy Pillow. Guy Furry doesn't just have a name eerily similar to a particular American celebrity chef, he also makes some nifty food when he stops by your house for a visit.. and based on his pose he may or may not be brimming with culinary confidence. As one may expect Guy Furry is an artisan cat, and also to be expected from a dedicated chef his power level is a meager 30. You have to be lucky to catch this little guy in the act. After Guy Furry has come and served enough sundaes and pizza to your other visitor kitties he'll leave you with his Custom Rolling Pin memento. Note: Guy Furry will not visit for Thrifty Bits with the Heating Stove, but he will visit for Thrifty Bits with the Glass Vase. Another rare cat with a taste for just about every food but a preference for very specific items, Joe DiMeowgio isn't too hard to get to pay you a visit. But his love of baseball means he won't stay long, he's got bats to swing and bases to run! Despite not seeming to want to play with the other cats, Joe is a real team player. And like a team player he has a relatively low power level of 28 to let his team mates shine -- and let other cats play with the Baseball item. Once he's had his fun in and around your home, Joe DiMeowgio will give you his prized Signed Baseball as a memento. 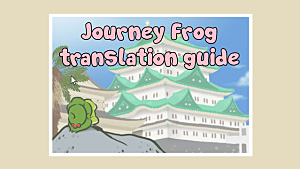 Kathmandu may seem a little odd but he would fit in right in a traditional Japanese court. His outfit and eyebrows definitely make him stand out from the other kitties. He's among the most regal of the cats you can meet in Neko Atsume. Fitting his refined appearance and demeanor, Kathmandu is all about classical Japan, so naturally the only items you can lure him with are distinctly Japanese. Thanks to his 150 power level he can take and hold claim of his favorite items easily. Once you've proven yourself to be high-brow enough for Kathmandu's taste he will give you his prized Fine Quality Writing Brush as a memento. Note: Kathmandu will visit for Frisky Bits with the Temari Ball, but will not visit for Frisky Bits with the Lacquered Bowl. A stylish cat like no other, Lady Meow-Meow certainly looks a lot more sassy than the cutesy Sassy Fran. This white and grey-striped cat looks like she doesn't take any lip from anybody. Lady Meow-Meow is an absolute diva of a cat, and she knows how to throw her weight around using her power level of 100. Unsurprisingly she isn't interested in mundane items like most other cats, she only wants to sit in the finest seat to lounge under the sun. Once she's had her fill of your personal Luxurious Hammock Lady Meow-Meow will eventually give you her prized Novelty Sunglasses as a memento. I don't know if I'd normally let a cat wielding a sword into my house, but Mr. Meowgi seems like a chill kitty. I still wouldn't leave him unattended, though! 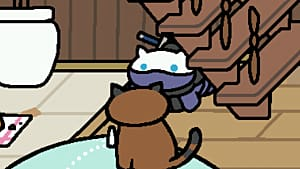 Mr. Meowgi doesn't just wander into your home with a sword, though. His mentoring personality means he spends plenty of time sitting and meditating, perhaps occasionally doling out advice to other kitties. If anyone can do it, it's him with his 250 power level. Once Mr. Meowgi has decided the feng shui in your home is on point he will give you his prized Odd Wooden Charm as a memento. Is this a famed lucky cat? Ms. Fortune certainly looks like a lucky cat with her bell collar and paw turned up toward her face. She very well may know something we don't, perhaps she knows when Tubbs will stop by and gorge himself on your hard-earned food. Ms. Fortune is a very charismatic cat, but she's not all-powerful as you may think. Her power level is a meager 20 so she gets out of the way when other, more forceful, cats pay the Cardboard House a visit. After she's made herself sufficiently comfortable Ms. Fortune will reveal she may in fact actually be a lucky cat by giving you her Oval Coin memento. You can't have a game centered around collecting cats and not have one that resembles the Sphinx, and Ramses is that cat. Named after the most famous Egyptian pharaoh, Ramses the Great is only visiting you for one reason: your pyramid-shaped tent. Much like other great Sphinx characters, Ramses loves riddles and is an amazing riddler. And like a good pharaoh should be, his power level is massive at an intimidating 230. Once Ramses the Great has spent sufficient time curled up in your Tent (Pyramid) he will grant you his greatest Elegant Staff as a memento. This is one spooky cat. 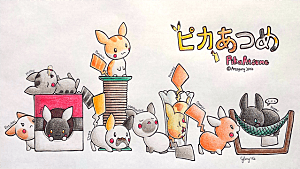 Saint Purrtrick looks less like a saint and more like a Nekomata, a sort of Japanese spirit cat with two tails. His piercing yellow eyes don't make him any less spooky, either. Saint Purrtrick is one of the less flashy rare cats, as he seems to only visit for a comfy place to sleep. Despite his basic needs his power level is one of the highest, sitting at an intimidating 222. Truly an awe-inspiring cat. After he's spent enough time sitting in your yard and home intimidating the other cats enough he will grant you a Mysterious Stone as a memento. These are two cats, right? Well it doesn't matter, because Sapphire and Jeeves are absolutely inseparable. Where one goes the other follows, and Jeeves seems to be a remarkable caretaker for the lovely Sapphire. Sapphire and Jeeves always visit together, but they are separate cats with different mementos and power levels. To fit her lady-like demeanor, Sapphire has a naive personality and meager power level of 20. Her memento is a Poetry Book. How cute! Jeeves is much more sturdy, with a nimble personality and one of the highest power levels in the game sitting at 210. He will give you a Silver Pocket Watch as a memento once the two have visited you enough. 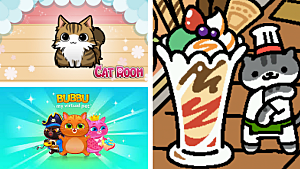 The two will only come for two items in combination with a number of food types, but many players seem to have them appear the most with Deluxe Tuna Bits and the Tower of Treats set out. Note: Sapphire and Jeeves will visit for Frisky Bits with the Fairy-tale Parasol but will not visit for Frisky Bits with the Tower of Treats. Who's sassy? Fran! Sassy Fran! Sassy Fran may just be one of the cutest cats in the game and she's got a passion for one item in your inventory: the coveted Cardboard Cafe. Her absolutely enthusiastic personality shines through in Neko Atsume as she tries to attract customers to your Cardboard Cafe, and she's no pushover with her high 180 power level. Once Sassy Fran has ensured the cafe is a success she will give you her cutest Coffee Cup as a memento. A clear homage to Puss in Boots and one of the few regal-looking rare cats, Señor Don Gato takes pride in his ability to hunt mice. But when he has his rapier out to fence, you better keep an eye on a particular mouse-shaped toy. Don't take this kitty at face value. Despite Señor Don Gato's cute face he has a scheming personality, perhaps to make up for his low power level of 30. He has to overpower the Mister Mouse toy somehow! Once he's gotten his fill of stabbing your Mister Mouse with his rapier, Señor Don Gato will give you his signature Feathered Hat as a memento. It is entirely possible this fat jerk has been eating all the good food you put out. Tubbs may very well be Neko Atsume's very own "bad guy", as he will stuff his face with any food above Thrifty Bits whenever he gets the chance. He often comes just to eat your food and leave. The only way to deal with this finicky feaster eating all your good food is to put the good food inside instead of outside. He's just too lazy to go in there unless you have the Giant Cushion set up indoors, which he will hog all to himself like the fat 130 power level jerk that he is. 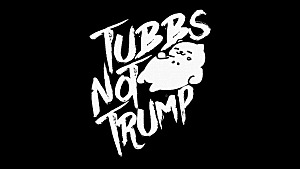 Once Tubbs has decided you are the person to mooch from in the neighborhood he'll give you some Fish Jerky as a memento of your terrible time with him. The last on the list and perhaps most royal cat in all of Neko Atsume, Xerxes IX needs little introduction. He's a grumpy-looking cat who will accept nothing less than the best. Just look at his face -- it's impossible not to feel humbled by this majestic, grumpy kitty. Unsurprisingly Xerxes IX has a regal personality befitting his attire and taste in items, and his 70 power level keeps some of the weaker cats from trying to overtake his kitty throne. Once Xerxes deems you worthy he will give you his prized Pretty Stones as a memento. And with that we've taken a look at all of the rare cats current in Neko Atsume, from the too-cute Sassy Fran to rough-and-tumble Bob the Cat. 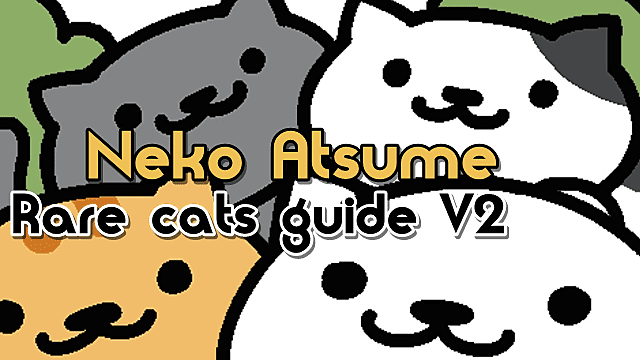 The game doesn't get too many updates, but when they do they always add at least one new rare cat -- and this guide will be updated in kind!